Moths are not always thought of as the most charismatic group. As you may know by now, I think they are quite fascinating. 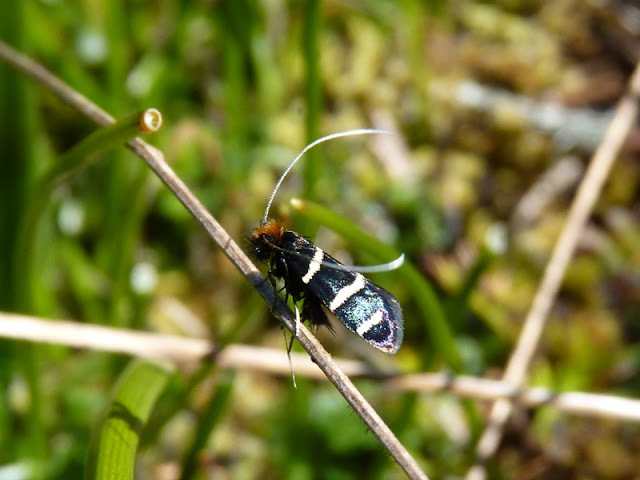 I don't like to play favourites but I have a special place in my heart for the family Adelidae: the fairy longhorn moths. They are definitely as whimsical as their names makes them out to be. 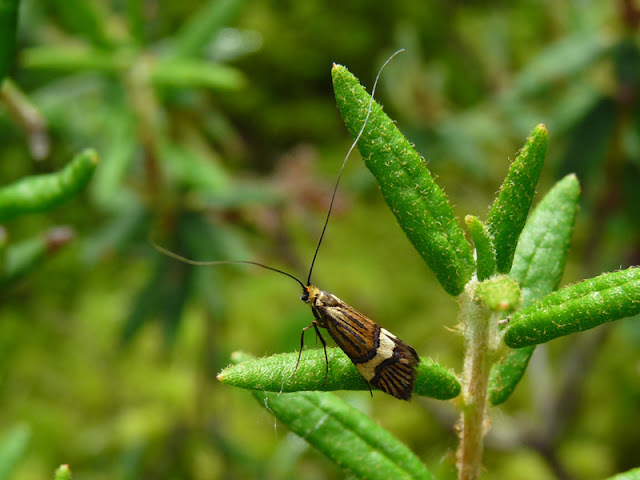 The first fairy longhorn moth I ever encountered was at Oak Haven Park in Brentwood Bay. I noticed a tiny, black moth with three white stripes, a fuzzy red head, and extremely long, gaudy antennae. At the time I thought most moths were virtually impossible to identify, but I gave it the old college try by perusing the internet. I managed to determine it was a Three-striped Longhorn Moth (Adela trigrapha). A couple years ago, I rekindled my interest in fairy longhorn moths by encountering two more species. Walking along the railroad tracks near Goldstream Provincial Park, I noticed some tiny moths similar to the Three-striped Longhorn, but they had only two white bands and a series of tiny dots near the tips of their wings. 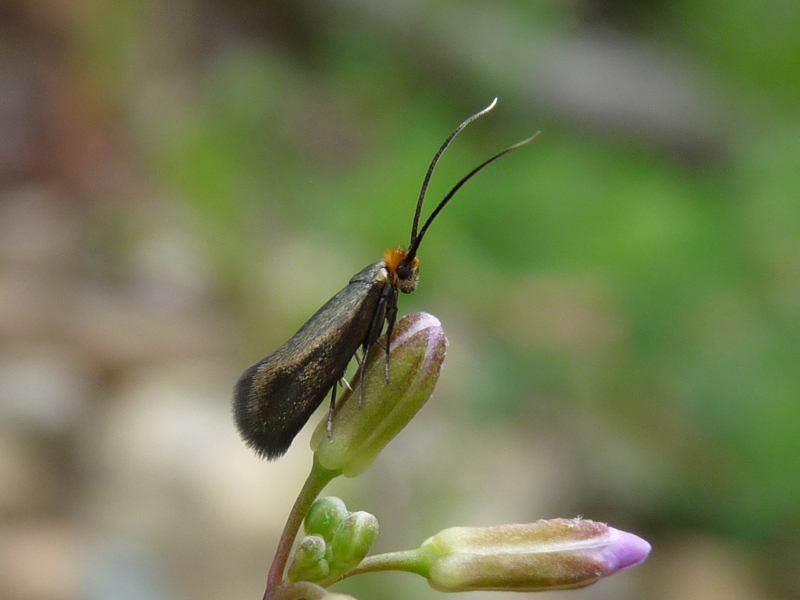 I went home and determined they were Ocean Spray Longhorn Moths (Adela septentrionella). The next species was found while bird atlassing along a logging road above Burton Creek south of Nakusp. At the side of the logging road, I noticed some small moths associating with Holboell's Rockcress (Arabis holboelli). They had that signature cuter-than-a-button look and fairly long antennae that made me think they were fairy longhorn moths. I was now significantly more adept at identifying moths and with some research and close scrutiny, I came up with Cauchas simpliciella as the best match. What's not to love? Cauchas simpliciella might just be the cutest moth I've ever seen! I connected with another fairy longhorn moth a couple weeks ago while working in Conklin in northern Alberta. The species was instantly recognizable as a fairy longhorn due to the long antennae, but this one had a pattern that put the three other species I'd encountered to shame. I pored over the Alberta checklist of Lepidoptera and was easily able to narrow down the identification as only four species fall under the family Adelidae. I checked what Nemophora bellela looked like at the Moth Photographers Group and found it was a dead ringer for the individual I had photographed. You have to pay close attention if you're going to spot any of the fairy longhorns, but the reward is worth it. These small, intricate little moths with antennae longer than their wings are always a delight.